A second iRacing Williams FW31 teaser video has been released with some exciting footage from a race at Road America. We can see what a typical race might look like with some cars using the official Williams livery and other cars in basic solid colour form. Subscribers will be able to design their own liveries too, so with time there should be enough creativity in the car skins to make the field look more interesting. I think I’ll be attempting to recreate an official Williams livery with alternative sponsors (to add a little bit of individuality). Another interesting aspect of this teaser is that it showcases the new shadow effects that will be included in the next build. The start of the video shows the ‘soft shadows’ from the Road America trees and I’ll be looking forward to enabling them, as apparently they are very low cost (FPS-wise) to switch on. Number 11 in the series is from Road America. Thanks again to Jay Bonvouloir for his generous permission to use his excellent source photography. The iRacing recreations come by way of the iRacing Road America 200, which was a special race event in the 2010 iRacing World Tour. 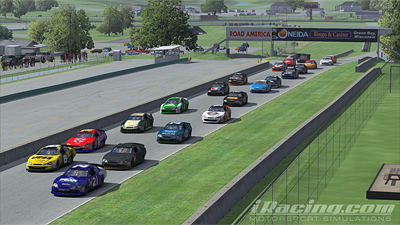 You can read my post on the iRacing Road America 200 by clicking here. A static page containing all the source images can be seen here, and you can see the previous sets in the series by clicking here. The iRacing World Tour continued with the Road America 200, 50 laps with the Nationwide Impala B at Road America. I had a decent quali and was set to start 22nd in the main event (which was broadcast on PSRtv.com). It was a pretty aggressive start with not a lot of room being given by anyone. That said, I managed to get through the first few turns without major incident. That soon changed after I was hit during braking into turn 5 (I think a car came spinning out of control from way way back) and I dropped to the back of the pack, but luckily my car seemed to be OK from the contact. I raced on, picking up a few spots up to 14th but disaster struck on lap 18 – my PC overheated and crashed! First time its happened and couldn’t have occured at a worse time! I scrambled to reboot the box and rejoined the race – 2 laps down and in 21st position. The worst thing was that there was no-one else on the same lap as me so basically I was in a race all by myself. I raced on, picking up positions from retirements and finished in 14th place and with no extra incidents. A pretty good result, but I was on track for an easy top ten had the PC not crashed. The next round in the World Tour features the Lotus 79 at Silverstone. Not my favourite car, and not my favourite track, but I’ll still be racing to see what happens.